How fortunate that we have this near neighbor, easily taken for granted but try to imagine how different the world would be without it. Leander enjoys “looking up” (he studied astronomy at ASU, his passion) and it’s only appropriate that he would find a clear night to capture the “biggest and brightest”, at least for this year, on June 22. Quoting Leander, “While it was hyped as such by the media it wasn’t that much bigger than last month’s full moon, in fact you wouldn’t notice it by looking. The moon’s total angular size only varies by around 15% or so from apogee to perigee, which isn’t really enough for humans to pick up on without equipment to measure the change.” He continues, “It was taken with an 80mm refractor telescope with a focal length of 400mm hooked to a D7000. The 80mm is the diameter of the aperture which is the primary spec usually quoted when talking about telescopes. This is actually three exposures combined in Photoshop to create an HDR with contrast and clarity adjusted in Lightroom. The HDR tone mapping is a toned down to make it look less cartoonish.” The final image is very sharp and detailed. This entry was posted in Nature, Watauga County and tagged Leander Hutton, Nikon on July 5, 2013 by GAR. Thank you for a wonderful moon shot…. 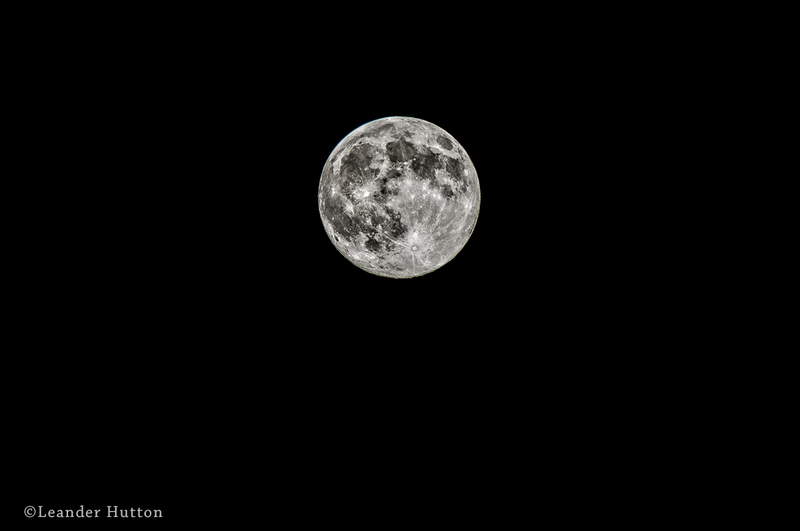 It felt like a larger moon….from south Florida it looked larger too! lovely-you did a great job leander! Impressive. Not only the photograph but also your knowledge about the subject. Thanks for sharing such a stunning shot. Beautiful photograph! What an inspiring, yet colorless, ball – not withstanding ‘apologies’ or ‘pedigrees’, I am so glad the moon wasn’t made the shape of a brick!